You’re growing your business. You’ve identified your ideal client avatar (ICA). LinkedIn is the tool to help you fill your growing business network with your ICA. And yes, you can get them to send YOU a LinkedIn connection request! Last week I showed you how to proactively grow your LinkedIn network full of your ICA. This week, I’m going to show you how to get your ideal client to connect with YOU on Linkedin! Three simple steps. You’ve got this! Here we go. 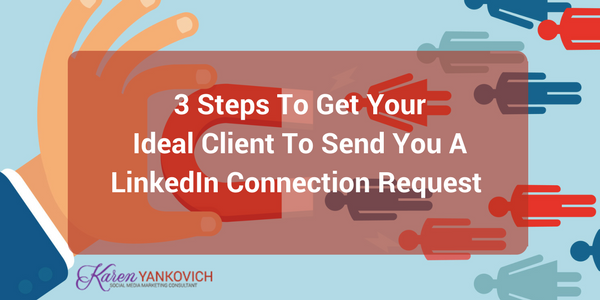 Imagine a steady stream of LinkedIn connection requests from your ideal client! Step 1: Do the profile work. It starts with a great profile. I can’t stress this part enough. You MUST show up in a big way. You MUST be clear about who you are, who you help, and how you help them. We’ll be driving traffic to your profile, so your profile has to be captivating. It’s easier than it sounds! Scan your LinkedIn profile. Is it consistent? Are you using the same “keywords” over and over? Ask a few friends! You want to be sure that you’re positioned as an expert, and that your profile is “client facing”, meaning, it’s about how you help your ICA, not just about YOU. Step 2: Identify LinkedIn Groups that your ideal client may be a part of. You can be a part of 100 groups on LinkedIn. One Hundred! Let’s look at this strategically. What groups would your ideal client be a part of? Do you support your ideal client geographically? One of my favorite LinkedIn secret strategies is using local networking groups! Let’s say you’re a Realtor. I’m in New Jersey, so I’d be searching for and joining “New Jersey Networking Group” “North Jersey Networking Group”, you get the picture. Join a few! Maybe you support online entrepreneurs. Look for digital marketing groups! Dig deep. You’ll be surprised at how many niche groups there are. There are two things you’ll want to take a look at before you join. Is it recently active? If there hasn’t been a post since the turn of the century, pass. How many people are in the group? I like to see at least 200 and no more than 4000. You want to stand out from the crowd, so let’s control the size of the crowd. If you go blank on where to find these groups, take a look at a few people you know who you would consider an ideal client. Take a look and see what groups they’re in! Then look at those groups, join a few, and look at the profiles of a few members and see what groups THEY are in. That’s it! For this step, identify and join. Shoot for 10 groups that you think your ICA is a part of. Take a minute to look at a few LinkedIn groups that you’re a part of. Go ahead, I’ll wait. Scroll through the posts. My guess is you’ll see a ton of blog post spamming. People going in to a group, and drop in a link to their recent blog post. With very few likes or comments. Where is the value in dropping in a blog post and leaving? If that’s all you’re doing in LinkedIn groups, you’re wasting your time. We already know Steve is semi-targeted as your ICA since he’s a member of that group, and now you’ve got Steve’s attention. Steve is going to get a notification, your name is going to be in his email box! There’s a pretty good chance that Steve is going to click on your profile to see who this person is that took the time to read his blog post. What happens next? Refer to step 1, Steve’s going to be impressed by your profile, and he’s going to send you a connection request. This is especially true if you are consistently in that group, sharing, liking and commenting. Do this for 15 minutes, every few days, Very little time out of your week. You’re developing a habit that leads to your ideal client asking to be a part of your network, continuing to fill your business network with a deep base of people who may be interested in buying your products and services. Warm leads. I’m here to support you. If you’re looking at your LinkedIn profile and you’re not sure where to start, I’ve got some free videos to help. Get started today, in a few months when you’re ready to offer that new program/course/service, you’ll be so glad you did. I have been trying to read a bunch of your stuff looking for a nugget here and there. I get one now and again. I don’t know I been doing this too long and kinda getting burnt out. The problem is I have been doing it for others and neglecting my own stuff it’s like starting from ground zero. One question I had is how the heck do you do you only do this for 15 minutes a day a couple times a week? Good reminder Karen on how reaching out with simple comments is an effective way to gain attention. Besides, you are likely to learn something. Karen, thanks for sharing. I’ve identified my 10 groups and scheduled 15 mins every few days… I’m excited to network and expand my reach.